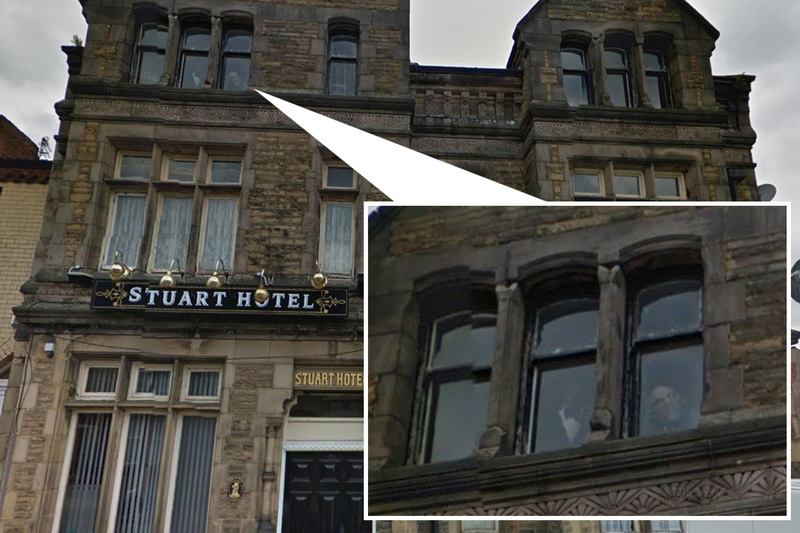 A Google streetview appears to have captured two eerie looking goggle-eyed ghosts in a Liverpool Hotel. The story was originally carried in the Sun newspaper along with details of the hotel’s haunted past. The two faces peer from the window and one appears to be very dapper in a bow tie and tuxedo….. The Stuart Hotel is apparently one of 150 haunted pubs in Liverpool. According to fellow paranormal author, Tom Slemen, “In 1897, the then landlord of the Stuart Hotel was a down-to-earth 41-year-old Wallasey man named Robinson Pemberton investigated a strange scratching noise in the cellar of the pub, and believed it was a rat, but then the noise became louder and was soon heard in neighbouring houses. “Three days later the pub was shaken from top to bottom and the windows of the pub were left open in case the vibrations shattered the glass. “The noise then stopped, but a drinker rapped three times on the walls of the pub one night – and received three knocks back. “The noise in the cellar then kicked off again, as well as the sound of a distant bell, which was heard for a week. According to Tom, a priest from St Mary’s Church left a Bible in the cellar and the noise was never heard again. Original story in the Sun here.